Keep their character, or keep up with the times? As Nashville is on the rise, many neighborhoods are having to make that decision, and in the Edgehill community, neighbors are split on conservation versus growth. At the Metro Council meeting Tuesday night, public comment regarding a historic overlay for about 200 homes in the community brought dozens of speakers to the microphone with many on both sides of the issue to voice their opinions. "We are fighting for history. We are fighting for more than just short-term people that come in and out with these Airbnbs that don't even live in the neighborhood," one supporter of the historic overlay said, adding that the more than 100-year-old neighborhood was important, specifically for African-American history, in the Nashville area. "We are fighting for the conservations of our homes." The historic overlay would prevent certain homes from being demolished to be rebuilt as new homes, and it would limit and restrict what changes could be done to existing homes in an effort to keep the historic character of the neighborhood intact. While many believe it sounds good in theory, in practice, many are opposed to the idea. 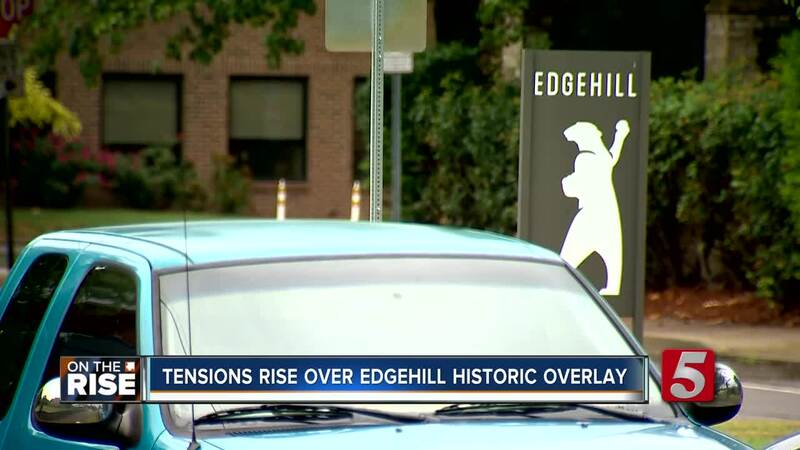 "I moved to Edgehill a year and a half ago and specifically purchased my home without an overlay with intentions to change my home over time as my family grew," one Edgehill resident said, urging the Metro Council to vote down the overlay. Others see the benefit of having a neighborhood able to develop without restrictions, increasing the value of the homes in the area and allowing new residents to move into the area. Councilman Freddie O'Connell represents part of the area that would be impacted, and he said he believes the issue was brought front-and-center due to investors buying homes and renting them out. “Honestly, I think some of this was sparked by the sudden increase of short-term rental activity in the neighborhood, and so the design of homes was actually catering to investor owners in that market," O'Connell said. The councilman voted in favor of the overlay in the second reading of the bill Tuesday night, but he said for him, it's hard to pick sides with so many of his constituents on each side of the issue. “I don’t see right now a place to turn that just sort of offers that epiphany of, 'Hey, guys, oh, here’s the thing that could unify us again,'" O'Connell said, adding that the debate has sparked a divide in the neighborhood. According to those against the overlay, they had previously reached out to those in favor of the overlay in an effort to get together and discuss possible solutions, but those in favor of the overlay were reportedly not willing to reach a compromise. O'Connell hopes that neighbors can find common ground -- if not on the issue itself, then in the fact that they all live in the same community and all care about what's best for it. The third reading for the historic overlay has been scheduled for August 21.